What started as a one-man garage operation over a century ago; producing furniture polish to peddle in a simpler era; has evolved into a manufacturing giant. Spanning four generations of hands-on ownership, Meguiar’s has become more than a family name – it’s become a symbol of tradition, loyalty, respect, dedication and uncompromising quality. Founder Frank Meguiar, Jr. made his first bottle of furniture polish in 1901, and unknowingly sowed the seeds that would ultimately become a grand family legacy. Back in those days he used an eggbeater to produce one bottle at a time by hand. Enlisting the help of his kids, Frank worked in the evenings to churn out enough bottles of polish to earn extra money for groceries. The introduction of the very first automobiles, popularly referred to as "horseless carriages" peeked Frank Meguiar, Jr.’s interest, these cars were made from wood and finished with furniture varnishes and sealers. Frank turned his attention to developing polishes to use exclusively on the “horseless carriages” – to protect the beauty of the finish. And so with the whole family contributing to the effort – the Meguiar’s name began to set the standard in surface care. Frank Meguiar was a stickler when it came to his formulations. Before it could be sold it had to pass his exacting standards. If it wasn’t perfect, he didn’t sell it. It was a code he lived by and instilled in his children... and even now that very same ethic prevails at Meguiar’s. Utilizing the best of modern technology, materials, and yes... some good-old-fashioned tried and true ingredients; Meguiars has developed a reputation in the surface care industry that distinguishes Meguiar’s products throughout the globe. Through the years, Meguiar’s has had the privilege of being the line chosen to polish a wide range of surfaces... from planes and trains – to automobiles, motorcycles, and boats. Motoring professionals, collectors, and enthusiasts rely on Meguiar’s to keep their vehicle surfaces looking gorgeous – from the concours to the golf course you’ll find evidence of Meguiar’s high standards. Early on, Meguiars Mirror Glaze polishes and waxes were developed for professional use and embraced by car manufacturers, car dealers, body shops, and detailers. Likewise most custom paint shops choose to use Meguiar’s polishes. And so it was that the majority of cars being exhibited at car shows were demonstrating the gorgeous finish achieved with Meguiar’s waxes and polishes. Car shows gained popularity throughout the 1960’s. Soon enough the masses of spectators were coming to recognize Meguiars as the product line vastly responsible for highly reflective and attractive finishes achieved on the concours. Demand for Meguiars products increased, as folks came away from these shows convinced they needed Meguiar’s products for their own cars. Bowing to consumer requests the family launched its Meguiar’s brand of automotive products for sale to the general public in 1973. Meguiar’s products have since penetrated the market so effectively that they are recognized worldwide. Such market saturation would not have been conceivable without delivering on the promise of unmatched performance. Today, you’ll see Meguiar’s products reflected in the cars the take the top honors. Meguiar’s sponsors and staffs more than 150 such shows across the country – and at the 50th anniversary of the prestigious Pebble Beach Concours d’Elegance, the most renown car show on the planet, 21 of the 25 Best in Class winners and the Best of Show winner all used Meguiar’s products to achieve their winning finish! There is no reason you cannot achieve the same stunning finish on your own ride – Meguiar’s is at your disposal. So use it! And gain over 100 years of surface care expertise, overnight! Browse our full line of Meguiar’s surface care products and you will find the winning combination of products to bring your detailing standard to the next level. You’ve done your homework – now use what really works! Buy from our fine offering of Meguiar’s, perfection is waiting for you just around the next curve! AutoGeek is geeky but cool! I was happy to find this store. Kind of a sharper-image meets JC Whitney, or the automotive counterpart to Think-Geek. I purchased two bottles of Meguiar's cheaper then other places. The shipping costs weren’t at all unreasonable. 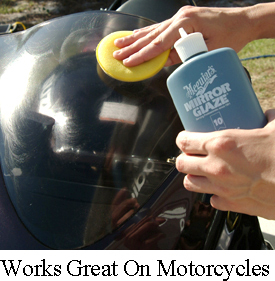 Meguiars Mirror Glaze #20 Polymer Sealant 64 oz. Meguiars M100 Pro Speed Compound 32 oz. Meguiars M100 Pro Speed Compound 128 oz. Meguiars M101 Foam Cut Compound 32 oz. Meguiars M105 Ultra-Cut Compound 8 oz. Meguiars M105 Ultra-Cut Compound 32 oz. Meguiars M105 Ultra-Cut Compound 128 oz. Meguiars M205 Ultra Finishing Polish 8 oz. Meguiars M205 Ultra Finishing Polish 32 oz. Meguiars M205 Ultra Finishing Polish 128 oz. Meguiar's M21001 Ultra Pro Finishing Polish 128 oz. Meguiars M305 Ultra Finishing Durable Glaze 16 oz.